It happens sometimes, that you run into a special encounter. You're standing there looking up in the air, lost through the tortuous streets of your heart, busy imagining the sky, to the extent that at times you almost feel as if you've lost the thread of your skein. Then one day, one day like any other, with the sun, the fog and perhaps a hint of rain, you find yourself in the middle of an intersection, and still gazing into the clouds, you unconsciously make a left turn. And it's right there, at the end of the curve, half by chance and half for fun, that it hits you. It's someone like you, half a soul mate with his own tangled skein, wwandering and looking up in the air, and clinging to your same ghosts, trying not to lose the thread. In that moment, under the tenderness of a random encounter in the rain, you understand why you had to make a turn at that intersection, why right that path, why those reflections in the mirrors have led you up to that point. Suddenly, exchanging umbrellas, your wandering starts making sense, and indeed the reason why for a long time you've ran around in a circle seems quite obvious, and so do all those curves, and those distractions, and the hills with no top, and the ways down into the night. The map of the labyrinth inside you starts getting a little clearer, and the countless times you've argued with whoever it was who drew it in you, slip away from memory. Without thinking too much, and with eyes still at the clouds, you feel that the only thing you're required to do is stretch your heart, hide your clutter a little bit, and make room for those like you who sometimes get tangled under the rain. It's at the end of the curve, and thanks to that unexpected encounter, that you decide to sit down for a moment, take a breath, and put off for a day the checklist of things. It's an afternoon like any other, with the sun, the fog and perhaps a hint of rain, the day when you exchange your threads, and organize an unlikely picnic by swapping a slice of cake and some toasted bread with jam. And then, when you start your ride again, you feel lighter, as if by magic, because you know that the skein is now a little less tangled. 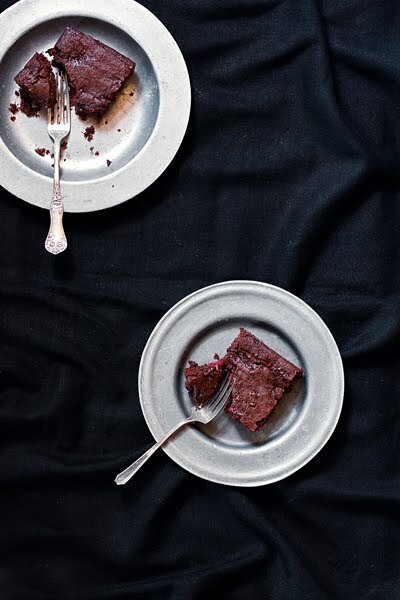 These bittersweet brownies, full of cracks but guilt-free, these soft, red and graciously imperfect brownies are the result of an encounter in the rain. I dedicate them to all those special people who suddenly happen to fall into your hands, and who unwittingly light your way. In a double boiler melt 120 grams of chocolate chips, and let cool. 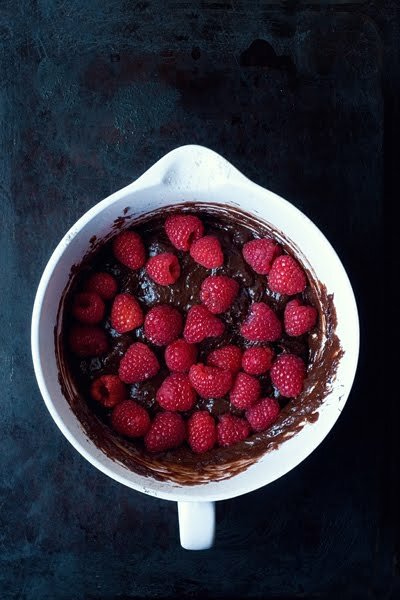 In a large bowl, combine the raspberry fruit spread with soy milk, sugar, oil and extracts. Beat with the mixer for few minutes until the mixture is smooth and without any lump. In a separate bowl, sift together flour, cocoa, baking powder, baking soda and salt, and add them by hand to the previous mixture. 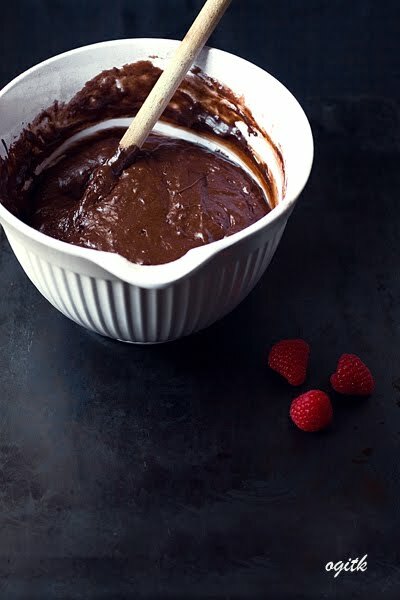 Stir well and then add the melted chocolate, the remaining chocolate chips and the fresh raspberries. The batter will be quite thick. Spread it in the pan previously greased with oil and dusted with flour, and level it with a spatula. You don't need to spread it to the very corners of the pan, because the batter will expand while baking and everything will be OK. No worries. *I adapted the recipe from Veganomicon, slightly adjusting the amount of chocolate and flour. This is my latest craze, which - I fear - one day I'll have to explain. But for now, just take them as they are, these crazy, reddish, guilt-free brownies.